Reference number for this case: 12-oct-54-Léguevin. Thank you for including this reference number in any correspondence with me regarding this case. Paris. -- The record of flying saucers was further increased by several testimonies, one from a mechanic from Léguevin (the Haute-Garonne), let the gendarmes and the military authorities think for a few hours that they were in presence neither more nor less of a case of espionage! Jean Marty, 42, rushed Wednesday morning to the gendarmerie brigade to inform the representatives of the law of his strange discovery. "I was working last night in my studio, on the roadside of Toulouse, when I noticed near Léguevin a kind of luminous disk that seemed to float in the air. It Was not more than 5 meters from the ground, but as soon as I approached, it rose noiselessly to the vertical and disappeared." "Intrigued, I approached the place where it had to land and my attention was suddenly drawn to the middle of the field by two sheets of white glossy paper covered with printed letters, and I picked them up carefully." The gendarmes leaned over, intrigued, onto the pieces of evidence. The sheets, commercial-type, were neither stained, nor damp, nor wrinkled, but of absolute clarity, as if they had just been torn from a new brochure. "But it's Chinese!" exclaimed one of the gendarmes. Fortunately Léguevin counts among its residents a brave soldier in retirement and polyglot, Mr. Maggy. It was a text written in an Annamese dialect, the Kuoc-Nn. The sheets are numbered 9-10 and 59-60, they come from a brochure reproducing an off-set, A typewritten document, but be careful, Mr. Maggy concludes gravely, "I do not understand everything, it's about Vietminh and Vietnam." This peremptory statement was enough to trigger a genuine investigation, the gendarmerie handing the two sheets revealing no doubt of an important espionage affair between the Martians, the Indochinese and the French, to military authorities. It was air safety that took the matter into its own hands and did it fast. A duly qualified translator was summoned, who, after a few moments of examination, made it difficult to find an irresistible desire to laugh. "These leaves come from a brochure published by the services of Prince Buu-Loc, they were undoubtedly left in Leguevin by Vietnamese who came... to picnic!" The Vietnamese students are particularly numerous in Toulouse, and Léguevin, located about twenty kilometers away and close to the wooded areas of the Gers, offers to Toulouse a sought after walking area during their weekends. As for the ultra secret text, it deals with fish arrivals in the Indochinese harbors! Morality: do not let your papers around! The region of Toulouse seems, moreover, to be a ground of predilection for the saucers pilots, because this "case of espionage" was scarcely classified that Mr. Olivier, industrialist in Toulouse, put again the authorities on the move. Wednesday, at 7:35 p.m., in a suburb of the city, Mr. Olivier saw a diaphragm of about 1m20, with a big head and two enormous eyes, which descended from a spherical gear posed in a vacant lot. The character came to him and his diving suit shone like glass. After a minute, he returned to his apparatus and had to bend to climb into it. He disappeared into the sky at a prodigious speed, leaving a trail of fire. "This is quite a shock," concluded Mr. Olivier, still under the thrill of emotion. The Martian of Montluçon knows only one expression: diesel! M. Laugere, a railwayman at the station of Montlucon, waited several days to tell his adventure, for he was afraid that his comrades would laugh at him. But as he saw in the newspapers that an ecnounter with a Martian was not so exceptional, he decided to speak. His story dates back to Sunday evening, Mr. Laugère crossed the tracks near the bridge of the S.N.C.F. on the river "Le Cher", when he saw a metal machine placed at a short distance from a reservoir of gas oil intended for the feeding of railcars. By the side of the apparatus, which had the form of a torpedo, and might have measured four meters, stood a man entirely covered with hair, unless he were dressed in a coat with long hair! Mr. Laugere, surprised, asked him what he was doing. The unknown replied in unintelligible terms, but the railwayman seemed to distinguish the words "diesel". The railwayman wished to return to the station to give the alarm, but scarcely had he made a hundred yards when he saw the apparatus rise vertically without noise. The author indicates that there was a testimony of Mr. Marty in Léguevin, but dating of October 12, 1954, and being distant from Toulouse, it should not have been caused by the pranks of the journalists of Samedi-Soir. These two French ufologists note a case which took place in Leguevin in the Haute-Garonne on October 12, 1954, with reference to the listing by Jacques Vallée and the ufology magazine "Lumières Dans La Nuit" for December 1969. They note that the information is sparse: Jean Marty, aged 42, who was in his craftsman shop, saw the landing of a luminous disc of approximately 6 m 50 of diameter and 2 m 50 of hieght. He tried to approach it but then the machine rose vertically at a speed qualified as "astonishing" by the witness. Oct. 12, 1954, 10:30 P.M., Leguevin (France). Jean Marty, 42, mechanic, was in his shop when he saw a luminous disk about 6.5 m diameter and 2.5 m thick, land. He tried to approach it, but the craft rose vertically and silently at an amazing speed. (Paris-Presse, Libération, 15 oct 1954, La Croix, 16 Oct 1954) (62, 63). The author indicates that on October 12, 1954, in Léguevin in the Toulouse area, a mechanic who was in his workshop at night saw a luminous disc on the ground, of approximately 6 or 7 meters diameter and 2 meters 50 in thickness. The witness tried to approach, but it rose vertically at a fantastic speed. J. Bonabot reports that once the disk had left, the witness found two sheets of glossy white paper on the ground, covered with printed characters. They were two sheets of a booklet written "in Indochineses" (Vietnamese) who mentionned ships arrivals in a Vietnamese harbour and related fish delivery. The two authors indicate that in Leguevin in Haute-Garonne, on October 12, 1954 at 10:30 p.m., the witness, Jean Marty, aged 42, mechanic, worked in his workshop located on the road of Toulouse at 1 km 500 of Leguevin when he looked up, saw a circular and orange luminous object which came to land in a field. Amazed, he went out, he crossed the road and moved towards the disc whichthen rose high in the airs, without noise, vertically, and disappeared at an extraordinary speed. The witness then reached the middle of the field to seek a possible trace and discovered none, but found, posed on the grass, two sheets of white glazed paper, with printed letters in Vietnamese writing. After investigation these papers seemed to have been forgotten there by a group of Vietnamese who had lunch in the field. The sources are indicated as the Vallée catalogue, case 244; C. Garreau and R. Lavier in "Face aux ET" page 109; Michel Carrouges in "Les apparitions de Martiens" page 166; La Croix for October 15, 1954; Les Echos for October 15, 1954; Paris-Presse for October 15, 1954; Libération for October 15, 1954. "In Haute-Garonne a gendarme reported watching a saucer land in a field and seeing a troop of Martians 'the size of ten-year-old boys' deploy through the trees. The saucer was gone when the villagers got to the scene, and so were the Martians,but some papers were discovered lying on the ground. Savants of the University of Toulouse were asked to study them to see if this might be a Martian declaration of war. After some anxious hours, the documents turned out to be written in a dialect of Indo-Chinese. They had been dropped by some Indo-Chinese students on a picnic two days earlier." 229. The Belgian ufologist indicates that in 1954, on October 12 in France in Leguevin, "Jean Marty was still in his shop at 10:30 p.m. when he saw a luminous disc approximately 6,50 m in diameter and 2, 50 m thickness, which lands. He tried to approach but the craft rose vertically in silence at an astonishing speed." She indicates the sources of the above as "Paris-Presse, Libération, 15 Oct 1954, La Croix, 16 Oct 1954" and "Jacques Vallée: 'Chronique des apparitions ET' - DENOEL 1972 - J'AI LU COLL. - p. 278". She adds that another version says: "Mr. Jean Marty witness of the landing of a luminous disc. After the disappearance of this craft the witness discovers "posed on the grass" two sheets of smoothed blank paper, covered with printed characters. They were two sheets of a booklet written in Indochinese mentioning the entries of ships in the harbour of Indo-China as well as the fish arrivals." 1954 - Jan Marty, age 42, a mechanic, was in his shop in Leguevin, France when he saw a luminous disc land. It was about 6.5 meters in diameter and 2.5 meters thick. He tried to approach it, but the craft rose vertically and silently at an amazing speed. (Source: Jacques Vallee, Passport to Magonia: A Century of Landings, p. 226). 10:30 p.m. In Leguevin (France), Jean Marty (42-year-old, craftsman) is in the shop when he sees 1 luminous disc approximately 6,50 m in diameter and 2,5 m thickness, which lands. He tries to approach but the craft rises vertically in silence at an astonishing speed. The sources are noted "Paris-Presse, Libération, October 15, 1954" "La Croix, October 16, 1954". Luc Chastan indicates that in the Haute Garonne in Leguevin on October 12, 1954, "the witness works in his workshop located on the road of Toulouse at 1 km 500 of Leguevin. He sees at 22:30, while looking up, a circular and orange luminous object which is posed in a field. Intrigued, he comes out, crosses the road and moves towards the disc which then rises in the airs, without noise, vertically, and disappears at an extraordinary speed. The witness goes into the center of the field to seek a possible trace. He discovered none, but found, posed on grass, two layers of glazed paper, white, covered with printed chracters in Indo-chinese. After investigation the latter seem to have be forgotten there by a group of Vietnamese who had a picnic in the fields." The website indicates that on 12 October 1954 at 22:30, in Leguevin, France, "Jan Marty, 42, mechanic, was in his shop when he saw a luminous disk about 6." The website adds: "Jan Marty, age 42, a mechanic, was in his shop in Leguevin, France when he saw a luminous disc land. It was about 6.5 meters in diameter and 2.5 meters thick. He tried to approach it, but the craft rose vertically and silently at an amazing speed." And: "Jan Marty, 42, mechanic, was in his shop when he saw a luminous disk about 6.5 meters diameter and 2.5 meters thick, land. He tried to approach it, but the craft rose vertically and silently at an amazing speed." And: "An object was observed. Traces found. One saucer, about 20 feet across, was observed by two male witnesses, typical age 42, in a residential area briefly." The sources are indicated as Lorenzen, Coral E., Flying Saucer Occupants, Signet T3205, New York, 1967; Lorenzen, Coral E., Encounters with UFO Occupants, Berkley Medallion, New York, 1976, ISBN:425-03093-8; Bowen, Charles, The Humanoids: FSR Special Edition No. 1, FSR, London, 1966; Vallee, Jacques, Computerized Catalog (N = 3073); Vallee, Jacques, Challenge to Science: The UFO Enigma, Henry Regnery, Chicago, 1966; Vallee, Jacques, Preliminary Catalog (N = 500), (in JVallee01); Vallee, Jacques, A Century of Landings (N = 923), (in JVallee04), Chicago, 1969; Vallee, Jacques, A Century of Landings (N = 923), (in JVallee04), Chicago, 1969; Schoenherr, Luis, Computerized Catalog (N = 3173); Phillips, Ted R., Ted Phillips investigation files; Phillips, Ted R., Physical Traces Associated with UFO Sightings, CUFOS, Chicago, 1975; Hatch, Larry, *U* computer database, Author, Redwood City, 2002. 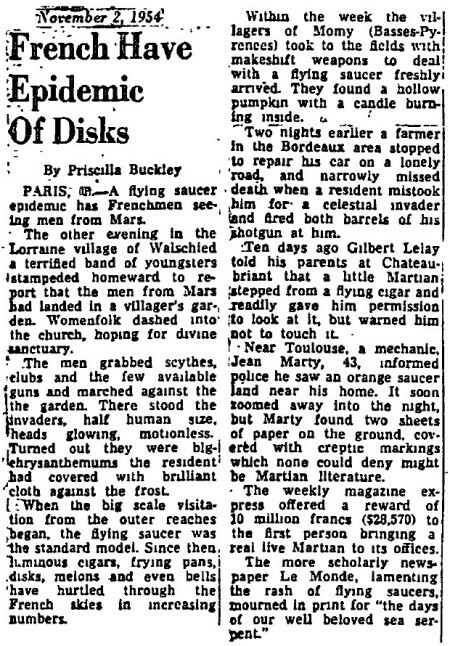 *Oct. 12, 1954 - Jan Marty, age 42, a mechanic, was in his shop in Leguevin, France at 10:30 p.m. when he saw a luminous disc-shaped object land. It was about 6.5 meters in diameter and 2.5 meters thick. He tried to approach it, but the craft rose vertically and silently at an amazing speed. (Source: Jacques Vallee, Passport to Magonia: A Century of Landings, p. 226, case # 244). [er1] Article in the regional newspaper L'Est Républicain, France, page 9, October 15, 1954. [---] Article in the foreign newspaper La Libre Belgique, Brussels, Belgium, October 15, 1954. [---] Article in the newspaper Les Echos, October 15, 1954. [---] Article in the national newspaper Libération, Paris, France, October 15, 1954. [---] Article in the national newspaper Paris-Presse, Paris, France, October 15, 1954. [---] Article in the national newspaper La Croix, Paris, France, October 15, 1954. [---] Article in the national newspaper Paris-Presse, Paris, France, October 16, 1954. [---] Article in the national newspaper La Croix, Paris, France, October 16, 1954. [---] "Current Saucer Reports: French and Italian Landings", article by James Moseley, in Nexus magazine, Book I, page 2, January 1955. [mc1] "Les Apparitions de Martiens", book by Michel Carrouges (aka Louis Couturier), Fayard publisher, France, page 166, 1963. [jv1] "Passport to Magonia - On Ufos, Folklore, and Parallel Worlds", book by Jacques Vallée, Contemporary Books publishers, USA, page 226, 1969. [gl1] "Face Aux Extra-Terrestres", book by Charles Garreau and Raymond Lavier, Delarge publisher, France, page 109, 1975. [jb1] "Phénomènes du 1er type", catalogue by Jacques Bonabot, GESAG, Belgium, case #465, 1972. [fr1] "OVNI, Premier Dossier Complet des Rencontres Rapprochées en France", book by Michel Figuet and Jean Louis Ruchon, Alain Lefeuvre publisher, France, pp 155-156, 1979. [lg2] "The Fifth Horseman of the Apocalypse - UFOs: A History - 1954 October", monography by Loren E. Gross, USA, page 91, 1991. 1.0 Patrick Gross March 11, 2009 Conversion from HTML to XHTML Strict. First formal version. Additions [go1], [dj1], [jb1], [lc1], [ud1]. 1.3 Patrick Gross November 25, 2016 Additions [lg1], [ub1]. 1.4 Patrick Gross December 13, 2016 Addition [lg2]. 1.5 Patrick Gross September 18, 2017 Additions [sp1].